Great recording session of Andrew Seligson’s, “Impromptu”. The premiere will be in Chicago on March 9th. 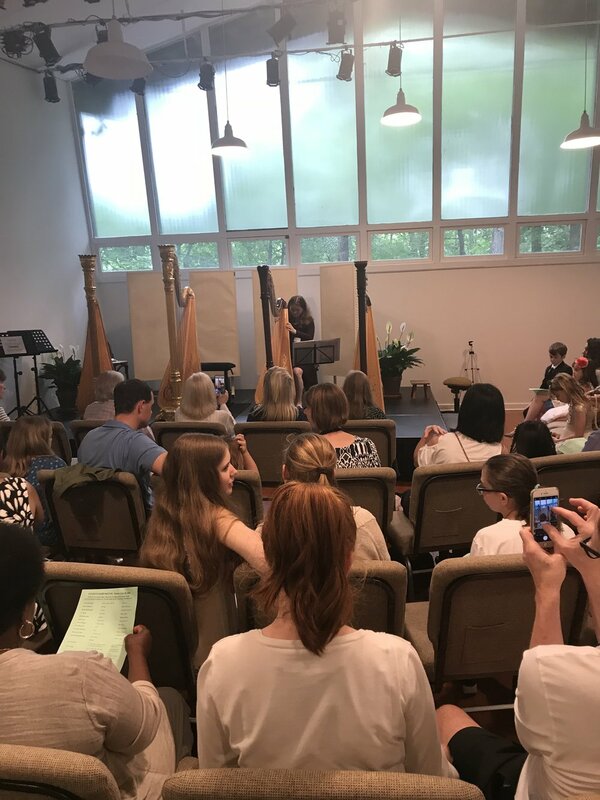 Music in the Woods hosted a masterclass and students learned to effectively prepare for the NISMA and CMEA harp competitions. Ms Kaufmann gave a mesmerizing performance along with Lisa Tannebaum, at Music in the Woods. Ms Culpepper joined Music in the Woods for an unforgettable performance. For more information on Concierge Concerts and took book your very own, click here. Dave Woodworth, the founder and the creator of the carbon fiber harp visited us here at music in the woods to let us try this new instrument. It is light to carry and sounds great! You can learn more about this harp here. Had a good time performing the Debussy Danses last night with the New York Session Symphony. It is always such a pleasure to hear all ages, especially when they’re so open to new ideas! I had a lot of fun guiding and teaching this masterclass and I look forward to many more to come! On Sunday I performed on the Faculty Recital Series at Music and Arts in Stamford. It’s always great to see the sweetest fans inspired by the harp! I had a great time performing as soloist with the Manhattan Session Orchestra at the Lennox Hill Neighborhood house in NYC. I had a terrific time performing at the Salon concert in Stamford, CT. Thank you for the thoughtful harp necklace - beautiful gift! Soundcheck complete. I’ll be performing an intimate concert in Stamford CT, as a part of Salon Concerts. See you soon! Join me Friday, October 19th at the Schubert Club. I will be performing a new transcription of the Debussy Danses for flute and harp. Details can be found on the poster below. I look forward to seeing you there! I’ll be performing new pieces at Atria on October 18th at 2pm. Atria is located at 77 3rd Street Stamford, CT 06905 I hope to see you all there! It's a wrap. Music in the Woods will start back in the fall! Music in the Woods wrapped up the season with two concerts on June 12th and 14th at the Treetops Performance Center. It has been a great year of planning, fundraising and showcasing for our events this year. We look forward to welcoming you here in the fall with exciting new events. Have a great summer and see you soon! Thank you for this delightful opportunity to be an integral part of the community. Performance and masterclasses at Cap Ferret, in France! This summer I'll be in France to teach and perform at the International Cap Ferret Music Festival, July 7 - 14. On July 9 come to a recital at 8pm, or a workshop from 3-5 on July 11. Then I invite you to the Debussy Gala, 8pm July 13. I am joyful to visit France and be part of this wonderful festival. 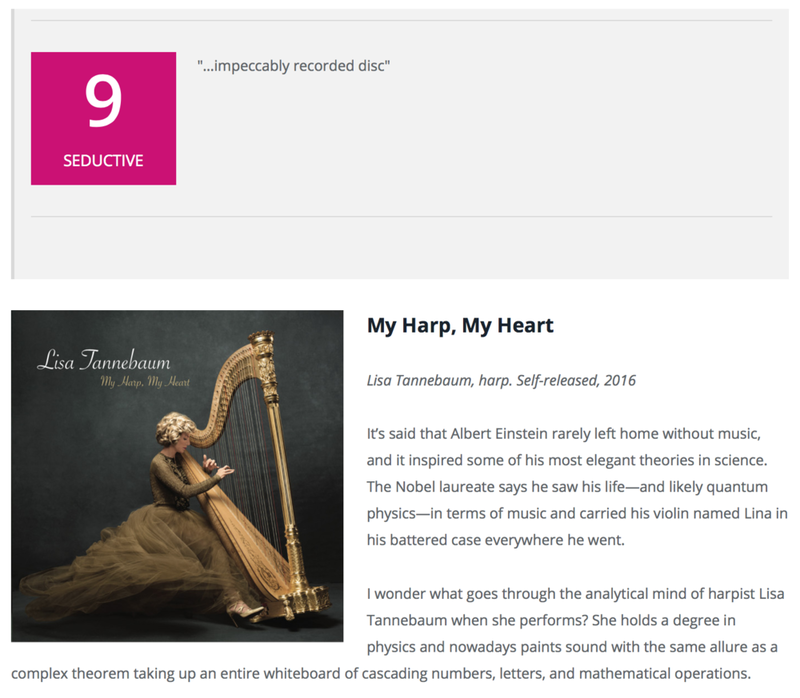 My latest CD "My Harp, My Heart" was recently reviewed on Harp Column. You can read the review in its entirety by clicking here. Music in the Woods presents a new way to book concerts for you, your family and friends. By purchasing Concierge Concert tickets, you buy a ticket now, and schedule the concert date and time at your own convenience. One weekend, benefitting two orchestras. Thank you Chicago!